TNT in action just before Tony Harnell‘s departure [second to last gig with the classic line-up]. This, however, was accompanied by the respective audio CD and on top of that, was even cheaper than the usual *2 for the price of 1* sets. Who could resist such an offer? But once again I got unlucky. A teeny tiny mark [I had to look carefully to spot it] on the last track, was enough to ruin the disc – not to mention my nerves! It won’t get past that point (skip a second or two), it just gets stuck trying to read the faulty sector over and over again, probably stressing the optical drive too. So much for the brand new shrink-wrapped factory-sealed CDs. AAARGH! I had no alternative but to rip the DVD disc instead. The setlist is identical [the duration of some tracks may differ though due to crowd cheering etc], all I needed was a programme to extract the audio stream. I used DVD Audio Extractor [v4.5.0], ripped the uncompressed audio [16bit, 44.1 kHz WAV] then made all necessary conversions [wav to FLAC & mp3 VBR V0 respectively] using the latest dBpoweramp as usual. Very nice post bro. Thanks. Awesome post -21grams, I love this band! I’ll go with the FLAC this time, ’cause I know I’ll like it. P.S. What about your bet on Napoli last week, did you win? 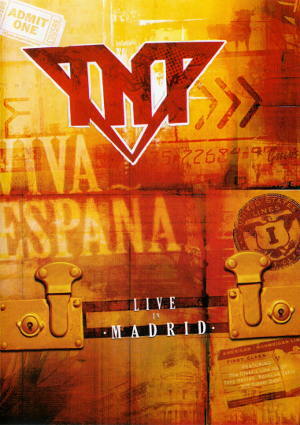 TNT Live in Madrid! I got a copy too recently, quite cheap for a DVD+CD set [approximately €10, still sealed]. Fortunately, I didn’t encounter any problems ripping it to mp3 for my personal collection. The trouble in your case has something to do with the CD exceeding the maximum audio length. CDs over 80 minutes long are off specifications/not compliant to the Red Book standard, and -more importantly- incompatible with certain players/optical drives. I wouldn’t be surprised if they proved to be more *sensitive*/prone to defects too. btw, the Audio Disc’s total timing is 1:22:02. Oh, I have to say that we share the same opinion regarding DVDs. While they are cool, it’s becoming difficult for me to dedicate time to watch concert videos. I also got the new Tesla DVD a couple of months ago. Watched it, encoded it to mp3 (no accompanying CD on this one). I think I’ll try the software you mentioned, DVD Audio Extractor. Up until now, I’ve been using Nero Recode which cannot extract to wav. The only available format is mp4 [at a 400kbps bitrate] which leaves a lot to be desired. Not available in the States since it was released in PAL format only. Can’t wait to listen. Thank you!